I have so enjoyed this 50th Anniversary year of The Berenstain Bears. I have loved watching them change and grow over the years, always full of great moral character! The illustrations have always been favorites of my family as a child and with my children today. 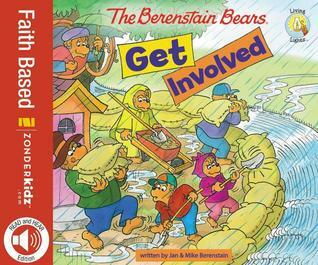 I am so grateful that Mike Berenstain continues the tradition of his parents with continued stories from Bear country! The church Cub Club provided the bears with lots of fun activities as well as opportunities to help others. Rain poured in Bear country for days and friends near the river were in need of being rescued. Brother and Sister bear had never been on a rescue mission before. They were cold, wet, and tired but blessed to have helped others. Suggestions in the back of the book help you get your own family involved for service work. Helping others is such a wonderful trait that we need to instill in our children. As you read this you can think of ways to bring the story to life through ministry in your own area. Great starting point for youngsters to get out and help others, and have a mind for missions. Brother has a birthday party and gets a new bike! While playing video games with some of his guests, cousin Fred decides to take Brother's bike for a spin. Brother is furious and chases after Fred, who crashes the bike! Brother runs off in a huff, so angry at Fred. He heads to the tree where he often goes to think, and Sister knows where to find him. She reminds him of some of their tiffs and how they forgave and overcame them, encouraging brother to do the same with Fred. Sister does a good job, and brother returns to his party. Lizzy, Suzie and Sister Bear were best friends and did everything together, including talking about all of the other bears in town. Mama mentions gossip and sister asks her what does gossip even mean? "Gossip is when we tell stories about others- especially stories that make them look bad. It's something we do to make ourselves feel special. It can be hurtful." Even adults can learn from Mama Bear as sister gets more entangled into the gossip web. Sister Bear walks up on them and hears them talking about her! What is sister going to do now? The bear family is going on a picnic, including Grizzly Gramps and Gran. As they are trying to find the perfect place for a picnic, we see a trickle down effect of disrespect. Gran and Gramps suggest a place and Mama and Papa think they know better. While Mama and Papa think they know better, and reminisce along the way, Sister and Brother talk about how they don't like the food, and how old their parents are. We need to respect our elders, and that goes for adults as well. Watching what we say and realizing that sometimes others do know better than us, is important for all ages. I have these 2 books to giveaway to 1 of my readers!! Rafflecopter seems to have a hiccup again, so going the old fashioned way!! Leave 1 comment below for each FB like you follow. 3 entries per person! Include your email and name in at least one of your comments so I can find you! I like Jubilee Reviews on Facebook! I like Zonderkids on FB! I like Bernstein Bears on FB! I "Like" Jubilee Reviews on Facebook! I "Like" Zonderkidz on Facebook! 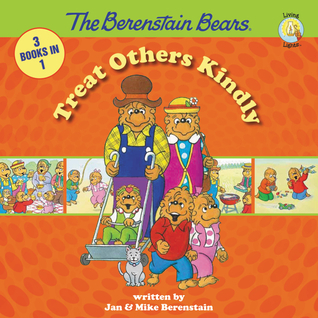 I "Like" (LOVE)Berenstain Bears on Facebook! I love the Bears!!! My favorite as a kid. I like the Bears on FB. And I like zonderkidz on FB. I like A Year of Jubilee Reviews on facebook. The Berenstain Bears bring back so many memories of reading these books to my son when he was little. I love that they have been around for so long and hope that children continue to be able to love them for years to come! !